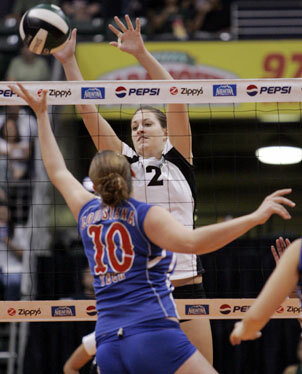 Amber Kaufman went up to block Kara Jones in an earlier match against Louisiana Tech at the Stan Sheriff Center. It's the third road trip of the month for Utah State, Hawaii's final opponent of the Western Athletic Conference volleyball regular season. But Aggie coach Grayson DuBose doesn't mind this one. "It is a treat to come to the islands and play in front of an appreciative crowd that enjoys volleyball," he said. "Coach (Dave) Shoji has set the bar higher for the rest of us. "Hawaii is the team everyone in the league is trying to become." So far, no team has come close. The Rainbow Wahine have won the WAC regular-season title every year they've been in the conferece and go for No. 12 tonight when hosting the Aggies at 7 p.m.
No. 10 Hawaii (21-4, 15-0) also goes for its 10th undefeated regular season in the conference as well as its 98th consecutive WAC home win. A victory over Utah State (16-12, 10-5) would also mean 109 straight in home conference play dating back to the Wahine's days in the Big West. Both teams then head to the WAC tournament in Las Cruces, N.M., the Aggies' fourth trip of November. "I wish the schedule would have been a little bit different," DuBose said, "but it is what it is. "There does not seem to be a point complaining about it because, when the whistle blows, you have to be able to get after it and play." That's the goal tonight for No. 10 Hawaii. To match its ranking with the number of undefeated Western Athletic Conference regular-season volleyball campaigns. Standing in the way is Utah State, which hasn't beaten the Rainbow Wahine in the past 22 meetings. The last came in 1981, before any of the current players were born. A win tonight gives the victor momentum heading into this coming week's WAC tournament in Las Cruces, N.M. Hawaii (21-4, 15-0) has already clinched the top seed, while Utah State (16-12, 10-5) is trying to secure the third seed that will come outright if it beats the Wahine. If the Aggies lose, there will be a coin toss with Nevada (14-11, 10-6) to determine Nos. 3 and 4. "Hawaii is always tough at home," said Utah State coach Grayson DuBose, whose team is playing its third match this week. "For us to have success, we will have to control the ball, i.e., serve and serve receive. "I think our biggest improvement (since losing to Hawaii on Oct. 15) has been our ability to sideout consistently for a long period of time. Since we last played UH, we have been siding out at around 65 percent." That improvement led to a six-match win streak following the loss to the Wahine. The Aggies then opened November with two losses (at Utah Valley State and at Idaho) before a big win Thursday over Nevada in four. The win over the Wolf Pack came on Senior Night in Logan, where seniors starred. Hitter Amanda Nielson put down a match-high 23 kills and the versatile Monarisa Ale (Kahuku '04) added a career-high 18 kills. DuBose, in his second season at USU, said he was going to miss Ale for a number of reasons. "She's been a wonderful player in our system," DuBose said. "We had her change positions and she did so without complaint. "We will miss her positive influence in our practices. She competes every day with enthusiasm and, as fun a player as she has been to coach, she's a better teammate and person." Although 5-foot-11, Ale ranks 10th on the Aggies' career block list. With 82 total blocks this year, Ale has helped Utah State lead the WAC in blocking, 26th nationally. Blocking has been a roller-coaster ride for Hawaii this season. The Wahine got outblocked 6-3 by San Jose State -- the worst blocking team in the WAC -- on Thursday. "We should have beat that team easier, but we didn't," Hawaii coach Dave Shoji said of the 30-25, 30-27, 30-14 win. "They played really well, earned most of their points. I'd like to look at it as a positive for San Jose and not a negative for us." The only negative for the Wahine was the negative hitting by junior hitter Tara Hittle (-.182). Still, Hawaii hit .339 as a team, helped by the 1.000 from reserve senior middle Kari Gregory, who put down all four of her swings, and .727 by sophomore middle Amber Kaufman, who had eight kills with no errors in 11 attempts. When the teams met last month, the Wahine were outblocked 12.5-9 but still won in 92 minutes, 30-27, 30-17, 30-22. Note: Except for Nos. 3 and 4, the rest of the seeds for the WAC tournament have been determined. Hawaii is No. 1 and will face the play-in winner between No. 9 Louisiana Tech and No. 8 Boise State. The Wahine's quarterfinal match Thursday is scheduled for 11:30 a.m. Hawaii time ... Seeded fifth is Idaho, followed by San Jose State and Fresno State.